The Cooperstown Graduate Program's two-year course of study leads to a Master of Arts degree in History Museum Studies. A unique partnership between the State University of New York College at Oneonta and the New York State Historical Association, CGP offers students access to museum resources with the support of a state university. Public service lies at the heart of the Program; we believe that museums should be at the center of community life. CGP gives students the tools to make a difference. Join our friends, alumni, and students on Facebook by becoming a fan of the Cooperstown Graduate Program , follow us on Twitter, or check out our Youtube Channel. The Cooperstown Graduate Program trains creative, entrepreneurial museum leaders committed to generating programs and services for the public good. CGP trained professionals dedicate themselves to the development of strong institutions that play a central role in their communities, encouraging broad public audiences to use artifacts and the study of art and history as a catalyst for social change. Ethical behavior and fairness will guide all of our decision making and relationships with students. We are committed to providing students with training and experience that will enable them to work effectively with broad public audiences. We are committed to expanding the diversity of the museum profession. We are committed to teaching history and material culture that reflects the diversity of the American people. We believe that public service is at the heart of museum work and a critical aspect of our mission is to provide service learning through practical experiences in the community. We believe that museums exist to serve their audiences and the public good. Collections, exhibitions, and programs should address audience and community needs. Effective museums use cross departmental teams to create dynamic programs and exhibitions and to manage successful institutions. An important aspect of museum professional training at CGP is teamwork. The Cooperstown Graduate Program prides itself on creating a rigorous academic experience for students that includes the most up-to-date scholarship about museum work. As a leader in the field of museum studies, CGP faculty maintains currency in their areas of expertise and is committed to sustaining the national reputation of the program. We are committed to adopting projects that will benefit the field of museum professional training and enrich the lives of museum audiences. We are willing to experiment and take intellectual risks. 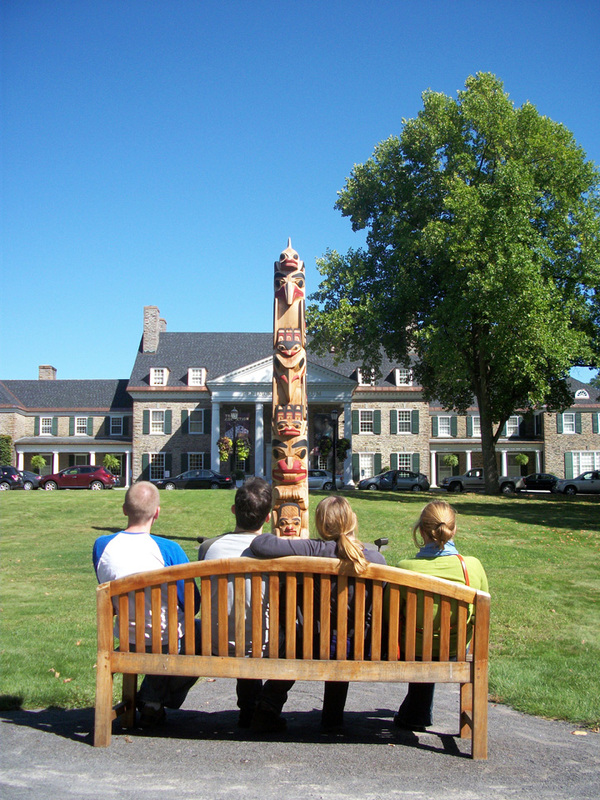 Students enjoying the beautiful scenary outside the Fenimore Art Museum.